Chocolate and mint are a great combination, especially when you use fresh mint. I used chopped mint leaves steeped in cream to make the ganache filling. It is addictive on its own and I love the grassy taste of fresh mint. The cupcakes are a slight variation on the recipe I have been using lately. The texture is a little less brownie like, but dense, moist, and not-to-sweet chocolatey, just like I like. I opted for peppermint extract for the frosting. I was doubtful of the outcome, but went easy on the extract and was very happy with the results. I am allowing myself only a half of one of these which I will eat later, so I will have to update the post with the “tasting notes” of the end result. I have tasted a number of cupcakes in the past year and am a little jaded, you could say. But the combination of the cake and frosting in this recipe is amazing. I could have had a whole one. I will be honest, you can skip the filling and keep it simple, the cake and frosting alone make one hell of a tasty cupcake. These are going on the must-try list! Hey, Mollie. Yeah frosting consistency is definitely a challenge, especially with melted chocolate! With plain-old buttercream, I keep everything at room temp, get consistency with powdered sugar, and use asap (buttercream gets crusty). With melted chocolate-based frostings, it’s a balancing act with regfrigeration, mixing, and ingredients. I love love love love your blog and your cupcakes! Where do you get your papers? I’m in Italy so little chance of finding them here but though maybe I could get them on the web. Keep up the wonderful work. sorry just found the answer in your faq’s! I’ve been hoping you’d use some fresh mint! 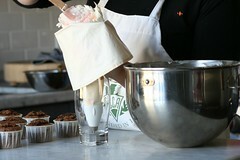 What type of piping bag do you use, it looks like a really good one. I am still trying to perfect my piping technique. Do you have any tips? I love your website, your cakes are heavenly. I am from Britain and I have just started my own cupcake business, but we just don’t have the “cupcake culture” here that you do in the states. Kepp up the good work, can’t wait for your next recipe. Did you end up using the ganache on these babies? I didn’t see any assembly directions. I assume you just cut in a cone, filled them, topped it back and then frosted with the buttercream? I’ve only filled cupcakes using my finger to poke a hole, so i am curious about your cone cutting technique. I have a non-cupcake related question. The kitchen I see in the photos (marble countertops, subway tile backsplash), is it the kitchen in your home or is it a professional space? Love your blog and keep up the great work! Kittee, Oops, I missed that instruction. My bad. I added it… I indeed used the cone method as the gananche is really thick. woohoo – big congratulations on your Chronicle mention today! Your cake pictures knock the socks off theirs. Wow! You are a superstar now. I can see the bones of the samoa cupcake recipe in the chronicle are the magnolia vanilla cupcake. That is a great base recipe, so glad I learned about that here. Great blog–I got directed here by the Chronicle article, and saw your recipe for the lemon, lime and grapefruit curd filled cupcakes. I have some key limes and Meyer lemons sitting in my fridge right now and I was wondering what to do with them. I would make these chocolate mint cupcakes, but the husband doesn’t like chocolate. He’s so weird. I’m so glad that I found your site! I made the Lemon LimeCurd filled cupcakes. They were wonderful and the gang I served them to were duly impressed. I happened to have a nifty new tool around and rather than cut out the cone to fill the cupcakes, I used this new melon baller (never had one before). Then I had a cool little treat for “we who can’t keep our hands off anything” – the cute little ball to dip in the leftover icing! I think that it was faster for me to do it this way – tho you can probably “cone” yours in no time flat. Wow, thanks so much for the step by step process on this one. Baking is sort of the “next frontier” of learning how to cook for me and you make it seem approachable. Thanks. i saw your photos on flickr. where do you buy those paper cups? i’d love to try using those to bake in, but i can’t find them anywhere. These new mint cupcakes look delicious!! I want to try them, but I have been having a problem with your chocolate recipes. I made the old one twice (Devil’s Food… and Ice Cream Cone Cupcakes) and the new one twice (Peanut Butter… and Cherry Chocolate…). I keep having the same problem. :-( They puff up really nice and then started falling down after I remove them from the oven. With the new recipe, I’ve had them flatten as far as 3/4” in those cups that you use. I played with the chocolate cherry recipe after the first batch fell. I added a lot more flour. They held up, but they were quite dry.=( Any help? Maybe 1 cup of my flour is too light, how much does yours weight? Anyway they were still delicious! I’ve made a few non-chocolate recipes and they came out very delicious!!! Keep the awesome cupcakes coming!! My whole family can’t stop talking about cupcakes. To everyone that keeps asking for the cups: Before you buy them online, go to your local restaurant supply store, they may have them!! Mine has about 6 different sizes. I bought 250 – 3.25 ounce SOLO cups for $3.90. There should be at least one in driving distance for everyone. Check your phonebook. Kristi, before you start adding flour, and what not… Are you sure they are being baked thoroughly? This could be a reason they are falling. Get a temperature gauge for your oven to make sure the oven temp is correct, then be sure to test cupcakes with a toothpick before taking them out. Test cupcakes in the front and back of the oven as they can cook unevenly. I have never had any of these recipes fall, but I used to have that happen to me in the past. I am certain it was because they were underbaked. Give it a try and tell me how it goes. Thank you for such a wonderful blog. I’ve never been a fan of cupcakes really, but your recipes and colorful pictures invite me to try them out. You’ve done a really fantastic job with your blog! Thanks for sharing all of your knowledge and tips – it’s really been helpful. Can I ask what size the cupcake is? Also, which tip did you use? I’m a beginner, so I’m just now getting comfortable holding the pastry bag and learning what the different tips do. Once again, great job! My oven is fairly new, and I have checked the temperature several times in the past. I also keep a pizza stone in the bottom of my oven to hold the proper temperature. I preheat well in advance to ensure that the stone and oven walls are up to temperature. I forgot to mention one odd detail. They fall in the oven, as well as out. I baked another batch last night (Mint). I took pictures so you can see what I mean. They puff up really nice, and then about half way… they start to fall. :-( That’s why I was thinking it was the flour. I don’t know what else it could possible be. I’ve never had such a baking problem before. I wanted to complement you on the Ricotta Raspberry Almond Cupcakes with Citrus Meringue Frosting! Those are soooo delicious!! I’ve been passing those out here and there. People go crazy over those. They’re like a mini master piece, the look and the taste. My sister keeps begging me to make them with strawberries instead of raspberries. Since those were so tasty, I can’t wait to make the cupcakes with raspberry mousse frosting. Yum!! I just tried these and they are delicious. I linked to your blog from the chronicle and am so excited to try more of your recipes. They all soung amazing! Thanks so much for posting them. Hey, kristi. I am so perplexed and bummed that its not working. I have never had either of those recipes fall, so I am confused as to what could be the problem. The only other thing would be the age of the baking powder/sodae. If its old and inactive, that could cause a problem. But I am grasping at straws here… Sorry! I just baked “Rich Chocolate Cupcakes Filled with Chocolate-Mint Ganache with Topped with Mint Buttercream” – half the recipe called for and only the choc cupcakes and I think they turned out really good. I was told that chocolate icing should go on top of these cakes. Any suggestions? I’d like to make them again for my lil’ tot’s birthday party. Hey, aud. Couple of options on the blog… This one which allows for varying based on taste (this version is pretty sweet) or just a straight up ganache frosting, like the one here. -how do I keep the cupcakes moist till the next day? 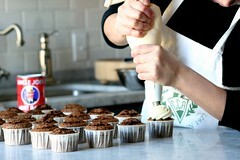 -would using self-raising flour or cake flour make the cupcakes fluffier? btw. everything is awesome here, including ppprompt reply! Really appreciate it! Thanks. As far as storing cupcakes overnight, there are many options depending on what you have on hand. Before you wrap them they should be completely cool. Its also best to wrap unfilled and unfrosted (easier to store a lot more and you won’t ruin the frosting), if you can put off finishing to the day of the party. 1. If you have these handy plastic containers, you can put the frosted cupcakes in them and then wrap with plastic wrap. 2. If you have tupperware, you can stack unfrosted cupcakes in the tupperware with a layer of parchment paper or wax paper in between each layer of cupcakes. 3. Otherwise, you can place the cupcakes on a sheet or cookie pan and wrap the entire thing with plastic wrap. I purchased industrial sized plastic wrap from Costco and it is very handy for any of these options. As for adding self-rising or cake flour. Self-rising flour has leavener already in it (baking powder), so adding that in addition to existing baking powder could ruin the cupcakes as oppose to making them fluffier (there will be too much gas and the cupcakes will run out of the papers). Although, I haven’t tried it, but this is my guess based on what I have read. Cake flour gives baked goods a more delicate texture, but I am not sure if they would be fluffier. You shoudl experiment next time you make some. Make a batch of cupcakes, but divide it in three before adding the flour, then add all-purpose in one batch, self-rising in one, and cake in the last. Maybe I will try that some time. Thanks Chockylit! Once again, awesome info and suggestions! I too am having problems with falling cupcakes. It happened with this recipe as well as the “Melt in Your Mouth Chocolate Cupcakes” which incidentally wasn’t your recipe. My baking soda is a little old. I’ll throw it out and see if that makes a difference. Thanks for your blog. Your presentation techniques are inspirational! You sure can chill it over night. It may be super thick and un-pipable, but leave it out at room temp for an hour or so and it should be fine. I will sometimes, if I am in a rush, warm it up slightly over a water bath. That is a little trickier, so letting the frosting come to room temp naturally is the best way to go. Hi chockylit, I’m having cupcake sinkage issues too. They look like Kristy’s… I will persist though. sorry to hear that. you want to make sure you beat enough at step 4, use fresh baking powder, have oven at the right temperature, and don’t open the oven door to soon in the baking process. I’m sure it MUST have something to do with one of the above. Muchos thanks, and I’m trying them again tonight! Despite sinkage though – they were all gone by the time I got home the next day – I think I ended up with some really ugly brownies…:D I had actually intended to turn them into mini Nigella cloud cakes, but no luck – all gone! You have to stop featuring all of these buttercream frosted cupcakes, you are making my stomach growl far too often when I am supposed to be being busy and important! Thanks for yet another great recipe. Yay! I am glad they worked. 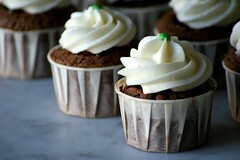 I used this chocolate recipe again this past week for the chai chocolate cupcakes and I just love it. Its a great base. A bit brownie like, but not too much so and always moist and chocolatey. I love love love love your blog and your cupcakes! i’m m’sia n want to know 3 stick butter or 1 stick butter is equal to what cup.. i’m not very good in measuring n this is my first time i try to bake cupcake. A stick of butter is 1/2 cup or 100 grams. Hi, I just found your wonderful site! I’m planning to try this recipe for a weekend get-together and was wondering if you have ever made these in a mini-size, and if so, do you forego the ganache filling? Hi, Sara. I have made the cake part mini-sized many times and it works great (baking time is closer to 16-20 minutes). I normally don’t fill mini’s with thick fillings like ganache, its a lot of trouble and results in a big mess. To be honest, I liked these just as much unfilled. I made them a second time unfilled for a party and everyone loved them. Hi chockylit! Love your blog. I’ve been a quiet observer for quite some time now. Cupcakes are my favorite. I have to chime in on the sinking issue. It happens to me sometimes, but I’m pretty sure it has to do with the high altitude here. I’m at about 6500 feet. I tried baking some lovely white chocolate raspberry cupcakes from Bon Appetite. The batter was delish, and they started baking wonderfully but fell in the oven 3/4 through baking time. I tried again increasing oven temp 25 degrees but same result. I gave up on that recipe but would like to find a way to make it work. Anyway, thanks for a great space full of recipes and pics. Love it! 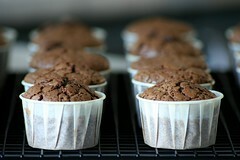 Hi Chockylit: Where do you get the baking cups? I’ve looked everywhere for them. I made these last weekend and they turned out so well! I have to admit that I was intimidated at first by all the steps, but I couldn’t resist giving them a try. They solved my problem b/c I wanted to make something chocolatey but not too rich/heavy during a NYC heatwave. I decorated them with green sugar crystals and no one at my party could believe I’d made them myself. Thanks for the great recipe! Hi Chockylit, I stumbled upon ur blog 2wks ago & hv since tried this recipe twice.My 2 young boys can’t thank u enuf!I grow mint in my balcony & am glad to hv found another way to use them :).Now, while waiting for my mint to grow,I’m going to try other cupcakes. btw, I read somewhere abt the cause of dome cupcake (I have that problem) but I can’t seem to find it. Wld appreciate your enlightenment. Many thks all the way from Singapore. Also, my baking powder is not very old, so I do not understand why this is happening! Nevertheless, I am going to attempt again and experiment with different cocoas. Jess – Please read the reply at the chai spice recipe. I want to make a peppermint frosting (not chocolate) using fresh mint leaves instead of peppermint extract. I have never steeped leaves, so am a little unsure as to how to do this. As there is no cream in the buttercream recipe, what would you suggest? Could I possibly steep the leaves in the 1/4 cup milk and then let the milk cool? Or would this affect the buttercream? Thanks so much for your always inspiring work. I just tried this recipe tonight, it turned out so good, I love love love the frosting. Mine didn’t fall but they didn’t end up as high as yours did. My baking powder is brand new so I don’t think that is it. If I don’t want the outside to be kinda hard should I decrease the # of eggs and maybe add something else to compensate. I made these for everyone for Xmas eve here at our place. It was total chaos here for hours, but when I handed these out – there was utter and blissful silent for 15 minutes. I am now a total follower. Thank you so much for this awesome recipe! I made these for my co-workers. These cupcakes are great! My ganache did not come out right. I think I used too little chocolate. I was left with this chocolate soup with chocolate bits. I just whipped it until it became Chocolate Mint Cream. That worked just as well. I made these yesterday without the ganache (due to time). The problem I had was that I ended up with way too much batter. It made 36 cupcakes, and that was from overfilling them! They all had completely flat tops that were basically a light flaky crust, kind of like a meringue. I concluded that I must have beat the eggs too long, so the batter expanded more than it should have, resulting in more batter and the strangely flaky tops. They still tasted good, but I’d like to know how to correct this for next time. I followed the directions exactly. The only thing is that I have a crappy five-speed hand mixer, not a stand mixer. I beat the eggs on the second lowest speed. Was this correct, or should I have left it on the lowest? The frosting was very delicious. It reminded me of the creme in a grasshopper cookie, but of course way more decadent and yummy. Can I replace the peppermint extract in the frosting with vanilla to make vanilla frosting? Hi, just stumble upon ur awesome blog. I’ve made a few types of choc cupcake before and these are the best. But the batter overflow, can u specify how much batter to put in the cup so that it baked just till the tip of the cup. Thank you so much. ps– valrhona choc is very very expensive here, can i use other type? I’ve made it three times now using 60% Ghirardelli chocolate and they’ve come out delicious! I have no doubts that Valrhona is superior, but it’s three times as much money. >. Hi, i had try to beat the frosting recipe, but somehow its alway turn into yellow and not white. Do you know why???? And how can i make the frosting to white. Hi chockylit, love your website. I tried your old fashioned chocolate recipe, the first time it turned out good and very delicious. My daughter called it heavenly chocolate cupcakes. but the second time, I was distracted and accidently put double the butter and it dropped but the taste still there. Will make it again. Hi, thanks for this wonderful blog. I am making the truffle cupcakes right now and am having the same issue as Kristi – they fall in the oven. I did forget to beat after the adding the sugar and waiting 10 minutes but I can’t imagine that to be the problem. Still, they taste really good! I was worried they’d be too sweet, but they’re not too bad. I think I’ll use a darker chocolate (I used Callebaut’s semi-sweet but there was no percentage on the block I had so I am not sure if it was closer to 60 or 70 percent). Anyway, thanks again! HI… These look great! I love chocolate and mint together… just went to a bakery in San Diego this weekend. They used a “grasshopper” buttercreme with a chocolate cupcake and then somehow dipped half the buttercreme top sideways with a big coating of chocolate that turned hard like regular chocolate. Any ideas on how you would do that over a buttercreme icing? It was incredible and the kids were as fascinated as I was! I was just to embarrassed to ask how they did it and wish I had now that I’m nowhere near! Thanks! I just tried making this frosting and it was a liquidy mess! :( It even started separating about ten minutes through frosting and I had to beat it again. I’m just getting started with decorating, and I’m making the cupcakes for my friend’s wedding this July! Any suggestions on how this happened? My kitchen is almost 80 degrees right now, was it just too hot? 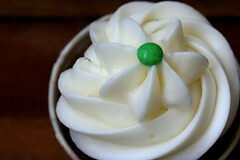 I would love to try this frosting again because it tastes much better than the ones that use shortening…Love your blog! I tried that frosting again (at a much more normal room temperature) and it came out perfect! Also, everyone loved it. :) Thanks for all the great recipes. I just made these for the first time only, I substituted raspberries for the mint and let me tell you, my family is in heaven! I added a pint of fresh raspberries to the cake batter and they still baked up perfectly. My first ones were a little denser than the second and I’m positive it was the baking time. I love the ganache filling. This was the first time I’ve ever done an extra step in my cupcaking making and I will say it was well worth it. I did omit the mint because of using raspberries. With the buttercream frosting, I made the recipe exactly and added in 3/4 pint of fresh raspberries. I felt like the flavor was a little off because of the smoothness of the buttercream and the tartness of the raspberries so I added one block of cream cheese and another cup of powdered sugar and it was perfect! I am very pleased and thank you for sharing! Amazing recipe! But I was just wondering how many cups of frosting does the buttercream recipe yield? For everyone asking about the little baking cups, I found some at my local crafts store (Michael’s) in the candy making section. Instead of making the ganache, i took some “After dinner mints” and pushed one into the centre of each cupcake before baking them. The frosting is just yummy. I drizzled melted dark chocolate over the frosting. Very nice. I’ve chosen your recipe to use in my baking science class to make gluten-free. However, my control test for this recipe is almost a complete disaster. I halved the recipe and used our altitude adjustment chart to adjust it (I’m in school in Colorado) as well as converted everything to the common weight (I had to). My product turned out a lot like Kristi’s–they puffed up but then they flattened out and sank in the middle. They had a good fluffy, moist texture but pretty much had no structure. I have to redo the control tomorrow to see if I can get a better product. My chef advised me that the cupcakes are way too greasy and tender so I’ll be decreasing the butter and increasing the flour by some. HOPEFULLY they turn out well. I’m just thinking that they might have turned out better if I didn’t altitude adjust! Hm, we’ll see. And if you like, I can let you know about my gluten-freeing of this recipe and how they turned out. Heaven you are a Chokylit “Rich Chocolate Cupcake”! I’ve been looking for an amazing chocolate cupcake and I just found it — thank you so much. These rose beautifully and are tender with a lovely deep chocolate flavor. I’ve been hoarding some 61% Valhrona extra bitter chocolate and decided to take a chance and break it out tonight and it was so worth it. Taking the time to let the oven come to the right temperature and testing for doneness properly are worth the time and effort and make a huge difference as well as using high quality ingredients. And I haven’t even gotten to the filling and frosting! Thank you!!! I made them, and they turned out wonderful! Thanks for this recipe! I am an experienced baker and followed this recipe perfectly. I had the same problem others had; my cupcakes sunk in the middle so dramatically some completely broke. I took pictures– I’m somewhere between furious (all the money and time I spent, wasted) and amazed (this is the first recipe that I’ve ever tried that did not turn out right)! So, I’ve been staring at this trying to find out where this went south. Based on the fact that I had WAY more batter than the amount of cupcakes called for, I’m guessing that the error is in step 4–beat with an electric mixer for 3 minutes. I did exactly this, but we all know that when we beat butter it increases in volume, especially when done at a high speed for 3 minutes. Which would explain the excess batter I had, and the fact that they were breaking apart– literally– falling into themselves. Too much air, not enough flour to hold it up… my batter was gorgeous, smooth and rich and fluffy… and that’s where you know you’re wrong. Another thing (clue that you’re on the wrong track) is that at 20 minutes your cupcakes are burnt. This is so disappointing. Honestly. I am just disgusted, I’ve never had anything like this happen to me before. And I bake ALL THE TIME. What a disappointment.